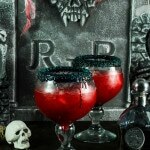 Raspberry margarita with peach made with raspberry puree, peach juice, lime, and a generous helping of tequila make this the perfect blood red Halloween cocktail! Rum a wedge of lime around your margarita glass rim and dip it in the salt. Spoon in the raspberry puree and pour in the Tequila. Stir it around a bit. If you stir it now, it will make it easier to mix with the juice when you have more liquid. Pour in the juice and the lime. Stir again. Add a handful of ice and serve!